Inevitably in the third trimester you will have a little surge of energy (despite the insomnia) and the overwhelming urge to nest. Before you know it, your little one will be in your arms, so it's a good idea to take advantage of this nesting phase and get your home ready to welcome your new baby. 1. Assemble the baby furniture. Don't push yourself too hard and get help from your spouse or a friend for anything too heavy or cumbersome. But you will want all your baby's furniture assembled and ready to use when you get home from the hospital. 2. Wash all the baby things. Clothes, sheets, changing pad covers, towels, cloth diapers, blankets, carriers, toys, bottles everything your baby is going to touch needs to be washed and organized. Separate and hang or store clothes by size. Make sure you use a laundry detergent that is made for babies or is 'free and clear'. 3. Pack the hospital bag. Labor can happen at any time and you want to be prepared when it does. Get your hospital bag packed and by the door for when the time does come. For daily use items that you can't pack, keep a written list on top of the hospital bag so you won't forget any of the items. 4. Deep clean the house. Take advantage of the desire to nest and put that energy into deep cleaning your house. 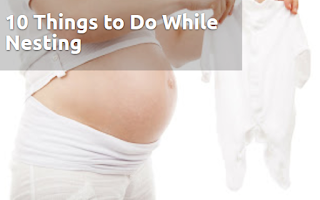 You will not have the time or energy to do it after baby arrives, so it's nice to get it done ahead of time. Just don't push yourself too hard. 5. Install the car seat. Car seat safety is vital. It means the difference between life and death. Nothing is more important than the life of your child. Take some time to look over both the car seat's manual and your vehicle's manual regarding car seat installation. Get it checked by a certified professional to make sure it is installed properly. Click here to find a car seat inspection location near you. 6. Start prepping freezer meals. Advanced meal preparation is one of the biggest lifesavers when you're surviving the first few weeks with a newborn. When your every moment is consumed with caring for that tiny little baby, it can seem impossible to find the time or to even remember to eat. But eating a healthy diet is essential for you to be able to provide your baby with the best possible care. 7. Obtain a post-pregnancy wardrobe. Unfortunately, when you have a baby, you don't magically lose all the baby weight. Odds are, you'll still look 6 months pregnant. So plan on sticking to maternity clothes for awhile or at least invest in some comfy yoga pants. If you plan on breast feeding, you will want to get nursing bras, breast pads, nursing tanks and shirts that you can easily pop a breast out of whenever your little one gets hungry. 8. Stock the pantry. You won't want to have to go grocery shopping with a tiny newborn. Make sure your fridge and pantry are stocked with all the essentials and that your cabinets contain all the toiletries you will need. 9. De-clutter the house. Chances are, your home has clutter and with a new baby comes lots of new clutter. Take this time to get rid of any old items your family no longer uses. Whether it's clothes, old toys or cleaning out the junk drawer. Have a garage sale or donate items that are still usable. 10. Take care of the bills. When your little one arrives, the last thing you want to worry about is overdue bills. Make sure your bills are covered, your finances are in order and your maternity leave is settled before the big day comes.